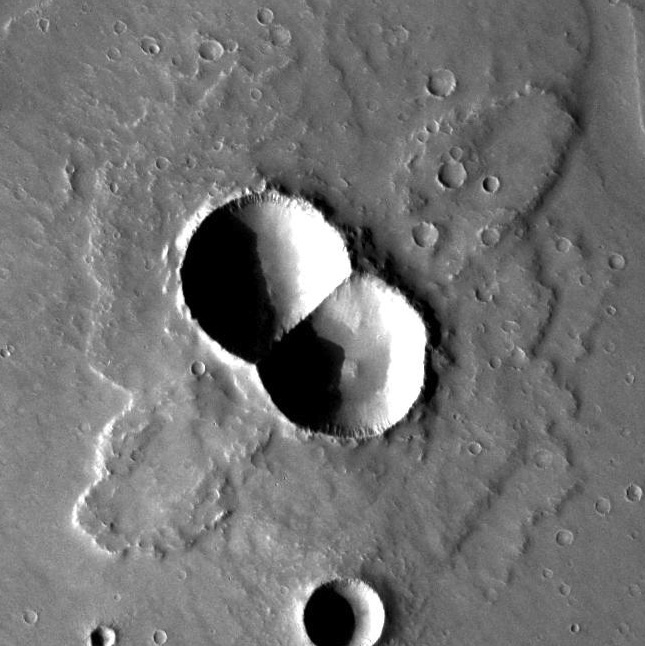 Double craters form when a pair of meteorites strikes the ground next to each other at the same time, traveling at the same speed. If both impactors are the same size, so will be the pair of craters they make. If the impactors differ in size, the resulting pair will likewise have different sizes. Because the two impact explosions occur at the same time in nearly the same place, their interacting blast waves shoot debris sideways. This makes "wings." But how can two meteorites hit together? Scientists see two possible explanations. One is that the original meteorite was not very strong. Thus aerodynamic forces as it passed through the Martian atmosphere broke it apart, and the two pieces hit the ground side-by-side. A second explanation comes from observations of asteroids, mostly using radar. More than 230 asteroids are known to be double or multiple bodies. That is, the asteroid is actually two or more rocky bodies either in contact or orbiting each other closely. While 230 is not a large number considering there are millions of asteroids, scientists estimate from that number that roughly 2 percent of all asteroids are double or multiple. As to how multiple asteroids can form, spacecraft studies suggest that many asteroids (including single ones) appear to be mostly rubble piles. Collisions between such bodies would break them apart easily and send possibly fragile pieces flying on similar trajectories. If Mars happens to lie in the path of such a fragment, it sets the stage for a double-crater-making impact.